This made me cry. What a beautiful thing to experience on your wedding day too. This was so sweet Bonnie. Definitely made me shed a tear or two. Your Dad was such an amazing man. His funeral, and your wedding, were both so beautiful and made me even more grateful for the gospel and our Savior. I've been thinking about you all day today. 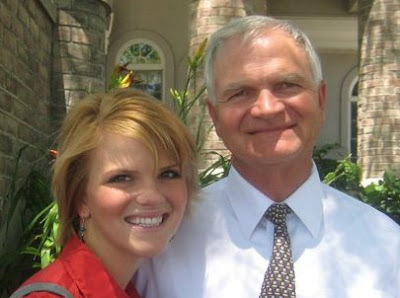 I've said it before: even though I only met your dad once, I could instantly see what a sweet man he is. What a great memory of your dad. Thanks for sharing. Te quiero mucho che! A beautifully written post. My Dad died 8 1/2 years ago. There's no doubt that it's terribly difficult. I wrote about it on my blog once. Anyway, I was going to say when I was sealed to my little family in the temple I'm positive my Dad was there with us too. Such a blessing, eternal families. This is a lovely post. The emotion in this is raw at its purest form and I thank you for sharing it. I almost lost my dad 2 years ago and I thank God every day that he is still with me. Unfortunately, he has been fighting for his life every day since then as he battles cancer. This was beautiful. And what a memory of your dad! I could feel it and it made my heart ache. Your words are so beautiful! I felt so much love, joy and emotion. I love it. Thank you for sharing such a personal and intimate story that you cherish of your dad. There is something really special about your memory. I can picture it so well. You are amazing! It brings me back to some of the special things I've done with my father and the special memories we will always have. I absolutely love this post. So tender and so dear. Oh Bon, so beautiful, so so beautiful. I found your blog through reading your guest post on Story of My Life (which I really enjoyed). I am enjoying your blog and will be back to visit again. You talked about being relatable in your writing, and I think you do a really good job of that. I started my blog a month after my daddy passed away (in April), and I so, so understand everything you described up there. Thanks for sharing! Thank you so much for this. You are such a great writer. Hi Bonnie - just wanted to let you know that we found your blog through your guest post on Across the Pond. & we're now your newest followers on GFC! We'd love it if you popped over to our blog to check ours out, as well. This post really resonated with us - we lost our dad a little over three months ago & something I always think about is what both of our wedding days (we're twins) will be like without him. It's nice to know that we're not alone.